Horseback riding with my #ElksFamily. After attending the Leadership Weekend in April and visiting my local Lodge––shortly afterwards, I decided to apply for the Elks Scholar Advisory Board. I was fortunate to be selected as an At-Large Representative. One of my first responsibilities was to attend the Elks National Convention in Reno. Jumping for joy with my fellow SAB members. 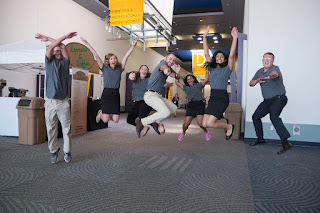 When I arrived in Reno, I had the opportunity to reconnect with my friends from the Leadership Weekend and meet the other members of the Scholar Advisory Board. 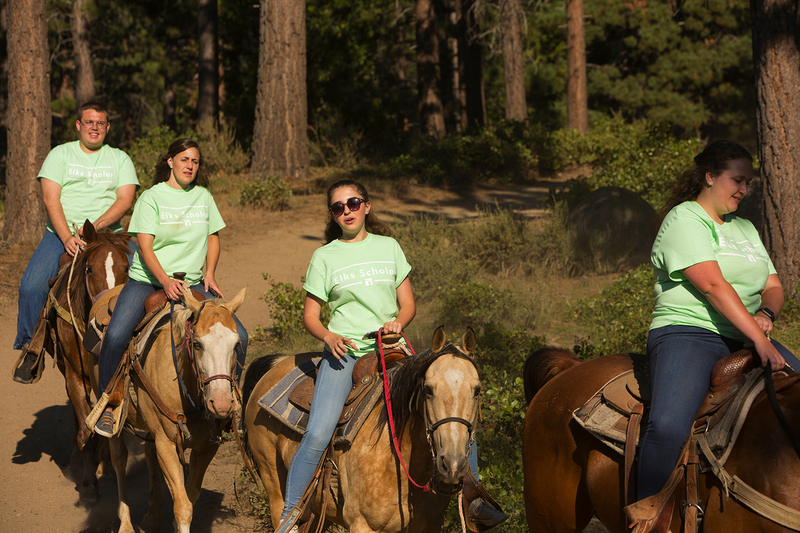 After everyone arrived and we were finished with introductions, we headed to Lake Tahoe to go horseback riding. It was my first time horseback riding, and I had an absolute blast! We ended our horseback ride with a good old-fashioned BBQ and s’mores around the campfire. By the end of the night, I was already so close with all the other scholars and was so excited for the next few days. We started the next morning with our Elks Scholar Advisory Board meeting. We spent some time discussing our plans for the coming year and the Elks 150th Anniversary in San Antonio next year. We had a very productive meeting, and I know some excellent ideas will be coming from the SAB this year! Meet other members of the SAB here. It was an honor to meet the Patterson family. 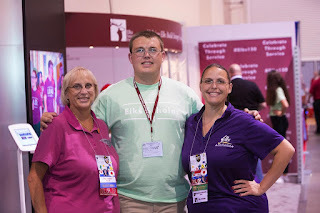 After we finished our meeting, we headed over to the ENF booth at the Convention center to meet Elks from across the nation. Personally, I had the honor of meeting the Patterson family, who selected me as the recipient of the Jeffrey E. Patterson Memorial Scholarship. It was humbling when Jody, Jeffrey’s wife, put her Lodge pin on my lanyard. It reminded me that Elks are a family. I also had the opportunity to visit the various booths including the Hoop Shoot booth and the Florida Elks State Association booth. It was great connecting with the Elks members and learning about all the activities Elks support across the nation. Gator chomping with the Smiths. 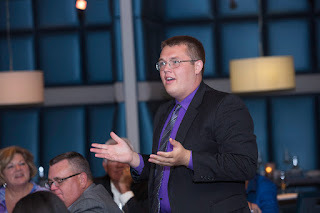 In the evening, the Elks scholars attended the ENF Donor Event “Fly Me to the Lex.” The donor event was Frank Sinatra themed, which I absolutely loved. One of my favorite moments of the night was meeting Past National President Mike Smith and his wife Sandra from Plant City, Fla. The Smiths are proud members of the Gator Nation. 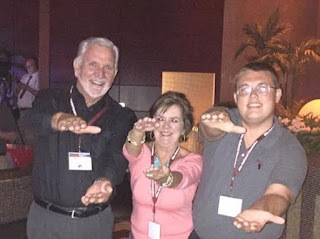 Of course, as a Gator myself, we had to get a classic Gator Chomp picture. The next day we picked back up with the SAB meeting to finish our discussions. In the afternoon, all the scholars had an opportunity to watch a live recording of Midday with the ENF hosted by Jim O'Kelley. Several scholars, including myself, even had the opportunity to go on-air to discuss how we got involved with the Elks! You can listen here. After Midday with the ENF, we headed over to the Convention Opening Ceremonies. 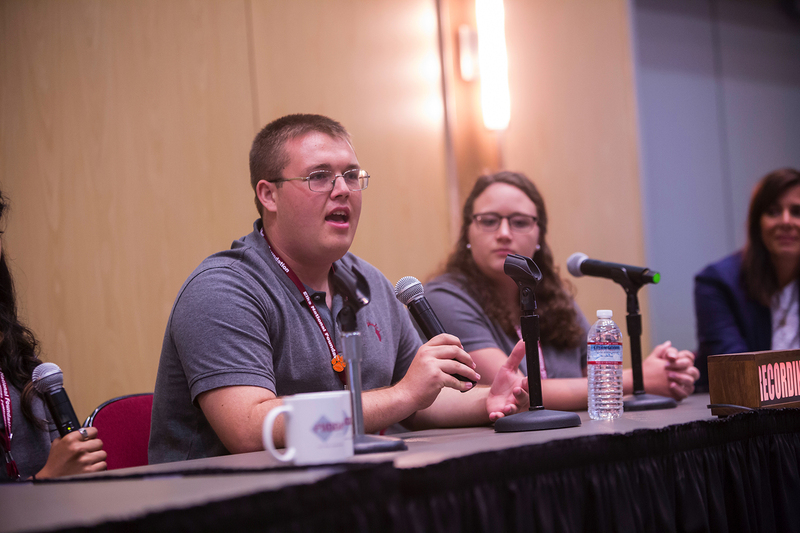 During Opening Ceremonies, myself and four of the other Top MVS scholars who attended the Leadership Weekend spoke about our experience. 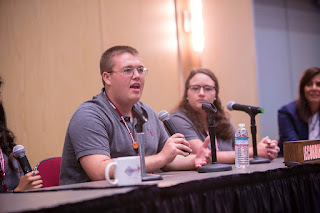 Then, we had the distinct pleasure of being on stage as the Top Female and Male MVS scholars, Zoi Urban and Colin Norick, addressed thousands of Elks. I was truly inspired by their stories, and I am so glad to be able to call them both friends. To top off the weekend, the Scholar Advisory Board had an opportunity to dine with the Elks National Foundation Board of Trustees. During dinner, we had some excellent discussions about the Elks history and what the future holds. However, like every good story, this dinner brought with it the end of our time in Reno. Alongside my fellow Elks scholars and the thousands of Elks members, I truly felt at home in the Biggest Little City in the World. I am proud to be a member of the #ElksFamily! I am already looking forward to #Elks150 in San Antonio! Speaking at the ENF Board of Trustees dinner. For 2017-18, the Elks National Foundation allocated $2.89 million to fund the Most Valuable Student scholarship program, which includes 500 four-year ranging from $4,000 to $50,000. For more information about the Most Valuable Student scholarship program, including eligibility and deadlines, visit enf.elks.org/MVS.